THIS was the scene after a dog fell from the roof of a block of flats and survived after it landed on high voltage electricity wires before then falling to the ground. 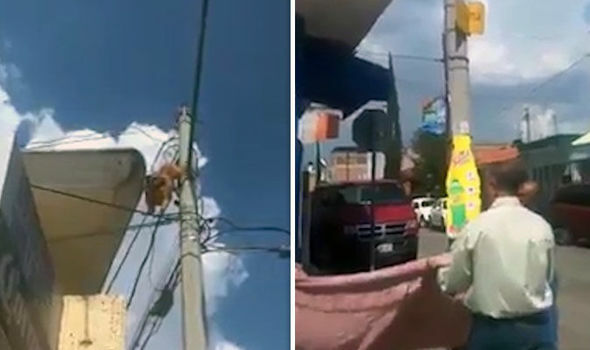 Smartphone footage shows residents holding out a blanket to catch the dog in the city of Aguascalientes in the central Mexican state of the same name. It eventually managed to free itself from the wires and fell into the makeshift safety net, surviving with nothing other than an injured leg. Local residents accused the owner, whose name was not reported, of jeopardising his pet by keeping it on the flat roof of the building. And he could lose the dog and others after Proespa, the State Environmental Protection Agency, said it would seek custody of the dogs and try to find new families to take them in. Local resident David Oliva said the property owner’s two dogs were always left on the roof of the building. The owner reportedly even put the injured dog back on the roof of the building after its fall. But Felipe Marquez, manager of the Animal Cruelty Humane Society International organisation, said he hoped it would not be there for long.